Sojourner was the first black woman to speak publicly against slavery. Born into slavery, she was sold to a family in upstate New York when she came of age. She could neither read nor write, and until she was emancipated at age 30, she spoke little English, having learned only Low Dutch from her parents and their masters. She had thirteen children, most of whom were sold into slavery. Upon being freed, she moved to New York City and worked as a paid domestic until she was 46. She then spent some years living communally with a group of religious believers and mystics, and it was here that she had the vision which changed her life : "God came to me and gave me the name 'Sojourner,' because I was to travel up an' down the land ... (and 'Truth') ... because I was to declare Truth to the people." 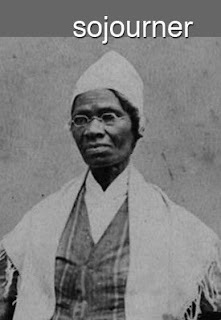 At age 53, having settled in Battle Creek, Michigan, she published her "Narrative of Sojourner Truth," a slave narrative. She sold it, along with small carte-de-visites bearing her photograph, wherever she preached, as a means of supporting herself. During her travels she encountered the early women's suffrage conventions. When Sojourner entered these (largely white) gatherings, all eyes turned to her. She favored a plain gray Quaker woman's dress, to distinguish herself from those who followed fashion, and to present herself as a professional woman, rather than a field hand or domestic. Standing six feet tall, she walked with the air of a queen, and her voice commanded authority whenever she spoke. On one occasion in Indiana, when accused of being a man in disguise because her voice was so deep, she tore open her robe and exposed her breasts, swiftly ending that argument. But it was her appearance at the Women's Convention in Akron, Ohio in 1851 for which she is most famous. Having listened patiently for two days to men who insisted on the inherent differences between men and women, she rose slowly and declared : "Dat man over dar say dat woman needs to be helped into carriages, and lifted over ditches... Nobody eber helps me into carriages, or ober mud-puddles..." Then raising herself to her full height, and her voice to a pitch like rolling thunder, she proclaimed : "And ar'n't I a woman?... I have plowed and planted and gathered into barns... and ar'n't I a woman? I could work as much, and eat as much as a man (when I could get it) and bear de lash as well -- and ar'n't I a woman? ... And dat little man in black dar, he say woman can't have as much right as man 'cause Christ wa'n't a woman. Whar did your Christ come from? ... From God and a woman. Man had noting to do wit it!" She concluded with: "If woman wants rights, let her take 'em." In 1864, she was invited to the White House to meet Abraham Lincoln. After the Civil War, she immersed herself in the task of helping to feed, clothe and house recently freed slaves who were living in desperate poverty, especially in Washington DC. In the nineteenth century, she was known and remembered from the Atlantic Coast to the western frontier. Today, it is her courage, integrity, unflinching allegiance to principle, egalitarianism and vision that immortalize her memory. What is a Late Bloomer? Originally a horticultural term applied to plants that bloom late in their life, "Late Bloomer" is also used to refer to people who find their niche late in life, and so "bloom" later than their peers. With advances in medicine and improved diets, we are living longer, and many people are forging new paths in areas of deep interest to them. However, doubts can discourage even the strongest of us, so finding role models becomes critical for success. While examples of late bloomers in history can be difficult to find, the task proves almost impossible for women, whose history has only recently been deemed worthy of recording. - and a third group who opted to change course midstream, and follow their passion, despite resistance and discouragement from loved ones and society. It is this last group that interests me most. Historians have categorized women in many ways, but not (so far) in terms of the age at which they achieved success. In addition, there was very little information on women who were not white and middle- to upper-class. In the end, I scanned the biographies of over sixty women, looking for birth dates and comparing them to career milestones. I also had access to the phenomenal minds of the women who work in the Sophia Smith Collection at Smith College and the Smith College Archives. With their help and resources, I found the talented twelve showcased here. This project is dedicated to Margaret Storrs Grierson (1900 - 1997), a late bloomer herself, who taught philosophy at Smith College until, at age 40, she took over the job of College Archivist. In 1942, she was appointed executive secretary of the Friends of the Smith College Library, as well as Director of the Sophia Smith Collection. Juggling these three roles, and with no formal training, she undertook the daunting task of gathering and cataloging women's papers, long before women's history was considered worth studying. The Sophia Smith Collection is now internationally recognized as one of the finest and largest of its kind. Thanks to her tireless efforts, we have access to an astonishing range of women's papers and materials from around the world. This research was undertaken in 2000 while an undergraduate student at Smith College. The author, Belinda Darcey, may be reached at Dolce Design.